Most people often misunderstand "value" to mean cheap. Value has nothing to do with the price of an item. Value investing is not about buying cheap stocks but about buying stocks which are worth more than they are selling for - regardless of where they cost $1 or $1000 per share. It can't be as easy as this otherwise everyone would be a value investor (does anyone set out to buy stocks which are worth less than they are selling for?). Value stocks are those which look cheap on the basis of assets or current earnings. Investors who buy stocks that are expected to grow earnings are growth/GARP/Blue sky/Recovery investors, depending on the situation. Alternatively you could be interested in dividends and be a (high) yield investor. Very good article, and one that I will want to return to in the future. But how to find it? Suggestion for Stockopedia; create a "best posts" folder, into which we can vote articles of long term interest like this one. The easy way to find articles on this site is using search, which is very good on this site. 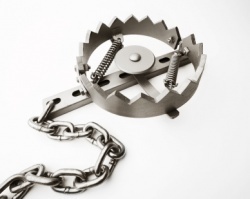 If you search for 'value traps' its the top link. http://j.mp/HcWu90 . We used to have an 'add favourite' link for specific articles. It's something we could add back in at some stage, but we've found that people tend to have their own bookmarking solutions for the entire web rather than for single websites so we aren't sure how much it would be used. Personally I use Instapaper (http://j.mp/HCzANw) rather than browser bookmarking as I can then read articles on my phone, kindle, laptop or anywhere. "Chanos argues that growth by acquisition is a major sign of a value trap." I think that this is a major thing to watch out for in AIM companies. You will often see rising earnings, giving if the feel of a growth company. The valuations can be uncharacteristically reasonable. BUT WATCH OUT. If that growth was by a series of equity fundings and acqusitions, I would suspect foul play. "Many seasoned investors and sell-side analysts wait until a catalyst gets ready to hit the market"
That's a bit of a contentious point, I think. Bolton, and a few other managers, never worried about catalysts. Finally, I like this little gem from Greenblatt: companies often run out of money before management runs out of turnaround plans. You could just bookmark it in your browser.